You may not know this, but you can get your concealed weapon permit in Wisconsin a lot easier and faster – and without the hassle and inconvenience normally associated with getting a permit. If you’re planning on getting your permit this year, good luck. Unless you live close to one of the scheduled classes you’re going to have to drive quite a ways, pay for gas, lunch, sit through a day or evening of class, drive back, pay a fee to get the permit and wait. And no one wants to drive from Rhinelander to Wausau (yeah, that is the closest spot to Rhinelander this year) in the snow and risk their life just to blow their budget on filling out a Wisconsin concealed carry permit application. Face it – you can’t protect your family if you get hurt or killed sliding off an icy road. So Are Wisconsin Concealed Carry Classes Online? So the list is long, but if you do not live fairly close to one of them, you can plan on a very long day, or night, if you signed up for an evening class. And unless you want to spring for a motel room, you just might be driving home before the plows have been through – not good. With our training, you could get your concealed carry license without having to leave home to brave the Wisconsin winter. Not only that, you will legally be able to carry in 28 states because of what’s known as “reciprocity” – the fact that your nice new concealed carry permit is valid in other states as well. You don’t need a concealed carry license for every state that you may travel through or even live in. Once you have gone through our online training, you will be able to apply for a Virginia nonresident concealed carry permit. That’s right, Virginia. The fine people of the state of Virginia passed a law a while back that allowed non-residents to obtain a concealed carry permit and take their training online without having to waste time attending a class in person. You don’t want to have to do that during a whiteout. Our five-step process ensures that any responsible, law-abiding citizen can get their concealed carry weapon permit. Better yet, getting your Virginia nonresident concealed carry permit fulfills the training requirements specified in Act 35 of the Wisconsin concealed carry laws. First, watch our training video. Take the easy 20 question test at the end. Then you can print your completion certificate and mail it with the Virginia Concealed Firearms application along with any other information required. Then just sit back and wait for your Virginia nonresident concealed carry permit to arrive in the mail. That’s it! Easy, right? You bet it is. But you might want to get this done ASAP – this training is proving to be so popular that Virginia is starting to have a backlog of people wanting to get their concealed carry licenses and you don’t want to have to wait forever to get a permit of your own if Virginia is wading through any number of people who cannot even send in the correct paperwork – if they can’t be trusted to send the right information, they certainly cannot be trusted with a firearm! What Do You Get With This Training? You’ll get expert concealed carry training from a former CIA officer who is also an author and contributing writer for several firearms and home defense magazines. You’ll get so much more than the basic training needed for your concealed carry permit. And the first thing that you’ll learn during this training is gun safety. Following these four simple yet critical gun safety rules means that you’ll never have to worry about a firearms accident and be more confident about safely handling any type of firearm. You’ll also learn how to properly store your firearm and how to teach your kids gun safety and what they should do if they encounter a firearm when there is no adult present, as well as whether you should keep your firearm loaded or unloaded, when and more importantly, why. Today, many states (including Wisconsin) have what are known as “Castle Doctrine” laws which apply to home defense. We will show you when you can invoke this type of home defense law and when you can’t. And just as important, we also show you how to reduce the chances of becoming the victim of a home invasion in the first place. This training should also be watched by the rest of your family as well – could they defend themselves if they were home alone? Would they know what to do if someone broke into the house while you were away and threatened them? You’ll also get my recommendations for the best gun for self-defense as well as a great concealed carry gun. Not sure if you want to carry a revolver or a semi-automatic pistol? We’ll help you decide which firearm is best for you. You’ll also learn how to properly fire a weapon to improve your accuracy and fix those bad habits that you may have learned along the way. And we’ll show you how to make sure that you always have the right ammunition for your gun. You’d be surprised at how many people buy the wrong type of ammunition. We’ll also show you which ammunition to use for self-defense and which ammunition to use for plinking. The right holster is more important than most people think. There’s no use getting ready for self- and home-defense if your gun gets stuck in your holster – you’ll be shot dead before you even draw your gun. I will discuss the various types of holsters (shoulder, ankle, etc.) and how to properly draw your gun so that you can draw it FAST, plus I’ll discuss the pros and cons of each type of holster. And on top of all that, I’ll also talk about other self-defense equipment that you can use, too – knives, flashlights, tactical pens, etc. There is a host of personal protection equipment that you can carry and use to deter a would-be attacker. Unfortunately, just because someone broke into your house in the wee hours of the morning doesn’t mean that you automatically have the right to shoot them. I’ll discuss several examples of when it is actually lawful to shoot someone in self-defense so that you won’t end up in jail for a long time. Concealed carry laws vary from state to state, but most of them are alike on when and where you cannot carry a weapon, concealed or not. This discussion includes such places as schools, national parks, restaurants and bars, etc. as well as certain federal laws that often get mistakenly violated. You’ll also learn what to do and say when law enforcement happens to pull you over so that you don’t get shot by some nervous rookie or end up arrested for no reason. This is one of the most important things that many people overlook. When they’re out shopping, running errands, getting groceries or at the bank, many people never pay much attention to what is happening around them and who is there. They’re busy, so they don’t think about the guy following them. Or worse yet, they are on the phone and have no idea that they are walking into a trap. That lack of attention makes them easy targets. I’ll show you how to avoid having to use your gun if necessary. I’ll also show you how to avoid being a victim in the first place, as well as how to spot a would-be attacker. What Else Do You Get With This Course? You’ll get a free copy of my book that discusses everything that you need to know about concealed carry, from ways to save your own life to how to handle the situation when you had to shoot someone in your home that threatened your family. And you’ll discover how to have a safe room in your house that won’t bust your budget and the critical items you’ll need to keep in there. Home security goes far beyond an alarm system. You’ll get my extensive, 108-point home security checklist so that you can be sure that your home is as intruder-proof as it can get. I’ll also tell you about seven ways that you can keep your family safer, as well as the three levels of home security that you should have, plus simple ways to intruder-proof your front door. This course also includes two targets so that you can learn how to deal with multiple threats and build confidence when shooting defensively so that you can find the right balance between speed and precision when you find yourself in a situation where there are a few baddies thinking that you are an easy mark. You certainly won’t have to endure a hurricane in Wisconsin, but there are times when snowstorms will snap power lines and leave you in the dark. Several years ago, lots of motorists were stranded on a 20-mile stretch of I-90 for hours and hours due to the snow, prompting some people to make sure that no matter what, they would have food, water and blankets in their vehicle. This guide will show you how to be self-sufficient for an entire month if the going gets tough, blizzard or not, including how much water and food to have, how to set it up and guns to keep for just such a situation. If all this isn’t enough, you also get a free book on how to handle it if the dollar collapses and the economy plunges to the bottom. 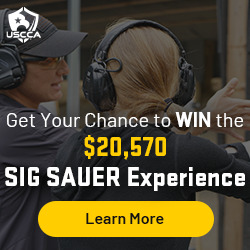 You’ll also get to be a tactical gear tester with your free membership to the Family Protection Association, plus a cool bit of free tactical gear. You can get your concealed carry permit at home, without having to worry about someone sliding full-tilt into your car on the icy roads, without having to pay for gas, lunch, class fees, motel room and still having to park a mile away. Wisconsin honors the Virginia nonresident concealed carry permit, so you’ll be ready to go after you finish this short course and send off the paperwork for your permit. You’ll have to do it soon, though, because Virginia is already starting to get a backlog of people wanting their permits!